A classic from the original Xbox is coming home. Fifteen years after the world’s most popular cartoon demolition derby smashed and slammed its way into the hearts of Xbox owners around the world, indie developer Finish Line Games is proud to announce that Cel Damage HD will slam onto Xbox One on March 11! 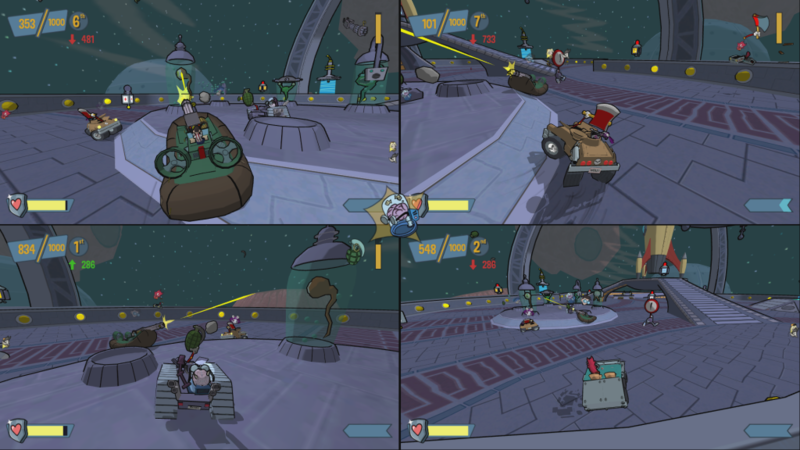 Cel Damage HD is a fast-paced vehicle combat game, where the world’s toughest cartoon drivers get behind the wheel of outlandish cars and battle each other in order to gain TV fame. The title’s four-player splitscreen couch-based multiplayer mode is dedicated to the old-school fans who prefer their trash-talking done in person, not through a headset. Cel Damage HD sports a shiny new coat of paint on its classic, signature cel-shaded look, with updated graphics that take full advantage of the Xbox One’s cutting-edge graphics power. Cel Damage HD also includes better game balancing that welcomes first-time players as well as cartoon combat veterans. With 10 playable toons, each with a unique car, combatants smash, shoot, slice, dice, and blast enemies into oblivion using an array of insane destructive armaments to earn personal glory, exploring 13 arena-style levels and nabbing more than 30 weapon power-ups along the way. “Cel Damage was born on Xbox and we are thrilled to see our baby launch on Xbox One,” said Daniel Posner, President of Finish Line Games. For more information regarding Cel Damage HD please visit us on Facebook and Twitter.